Hey guys! 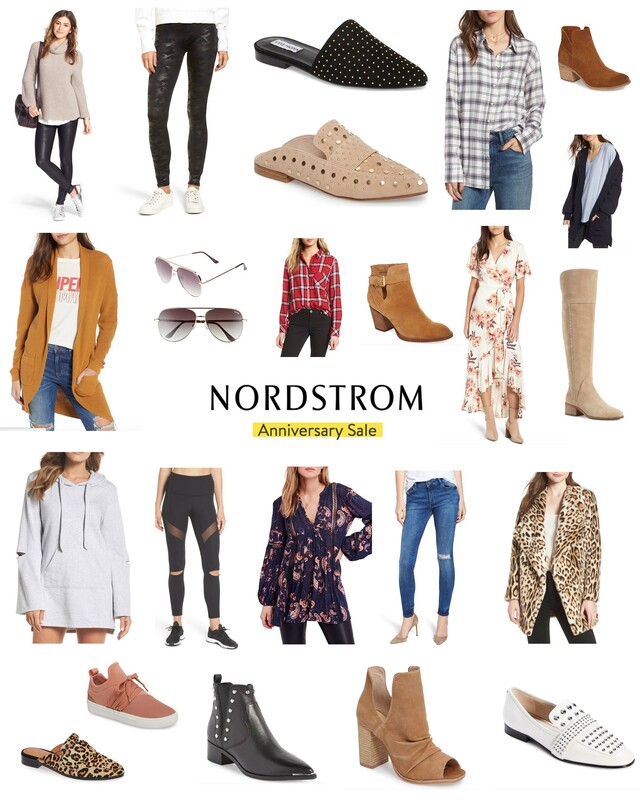 Wanted to hop on and share all of my Nordstrom Anniversary Favorite Finds since the sale went live to the public today. I want to highlight some trends that I think you should try including studded boots and flats and also inform you about some must-have closet staples that are on sale like the Spanx Faux leather leggings. Hope you find some things you like and can pick up at a fraction of the cost during the Nordstrom Anniversary Sale! I bought these Vince Camuto Over the Knee Boots and now is the time to buy them because OTK’s are pricey and you want to pick them up during the sale. Personally, I chose these Vince Camuto’s over other brands because of the practicality of the low heel and they come in extended calf sizes which is nice. I definitely recommend them if you have been wanting to try that Over the Knee boot trend! If you don’t have the Spanx faux leather leggings, they are a must-have closet staple and now is the time to buy them. I have the regular faux leggings but am grabbing a pair of the Spanx camo faux fur leggings that are now available during this sale. Some closet staples going on here for sure, especially with the plaid shirts and cardigans. I picked several of these up. SO DL1961 Jeans are hands down my favorite jeans but they are pricey. They have a pair of DL 1961 skinny jeans on sale during this Nordstrom Anniversary Sale so of course I had to include them on my list of Nordstrom Anniversary Sale Favorite Finds! If you haven’t tried these jeans, now is the time to give them a try. I hope you love them as much as I do! I’m also including this Kut from the Cloth pair of jeans for a more affordable option because they are a great price and have good reviews. You guys I recently bought a pair of Quay Aviator’s and am obsessed. They are 1/3 the price of Ray Bans and are on sale during the Nordstrom Anniversary Sale so grab some and give them a try! I wore the heck out of this Ugg Poncho last year and it is on sale and available in several colors! The Thread & Supply Wubbly Fleeces are on super sale and make AMAZING GIFT IDEAS as well. Last year I bought a bunch of these fleeces, had them monogrammed with initials or school logos for kids, and my entire family loved them! You know I love my funky and fun finds and here are a few random things I’m picking up that I think could be amazing if styled correctly! I think this leopard faux fur coat is going to end up being one of my favorite closet winter staples and I will wear the heck out of. The TopShop striped jumpsuit is amazing and I’ll keep you posted on how it fits once it comes in! I have had a million direct messages about the wrap floral dress we wore in our family beach pictures (blog post with all the pics coming soon). I can’t link to that exact dress but when I saw this one on the Nordstrom Anniversary Sale I thought it was very similar so I wanted to include in on my list! The great thing about these wrap dresses is they are classy, flattering, and can be worn in the summer or styled for fall with a cardigan and booties. Also, I get so many questions about my leopard flats so I wanted to include these calf hair leopard mules on my list as well! Both are great buys! Don’t miss out on the Cole Haan’s (which are a best seller) while they are on sale. Also including some awesome Patagonia outerwear and MM’s favorite underwear – SAXX. Oh yes my personal favorite – his navy Hugo Boss suit. It is such an amazing suit and it’s definitely best to buy it during the sale!!! HOME AND RUGS, RUGS, RUGS! SCROLL AND TAP TO SHOP!!! Here are all my Nordstrom Anniversary Sale 2018 Favorite Finds! CLICK ON THE BOTTOM OF THE PICTURE TO SHOP THE LOOK!